The McClean Report offers a broad look at the integrated circuit industry. The original 400+ page study (monthly updates provide approximately 500 more pages of information) is separated into 15 sections. About 400 tables, graphs, and illustrations in the original report clearly describe various market dynamics (another 400 tables, graphs, and illustrations are included in the monthly updates). Besides covering worldwide IC market conditions and economic issues, there are chapters dedicated to each of the major IC product segments. Likewise, trends pertaining to capital spending and fab capacity, as well as technology developments and packaging, can be found in other sections of the report. Links to summaries of each section in the report are provided below. The executive summary serves as an introduction to The McClean Report. It highlights the major issues that are detailed in the report to give the reader an idea for what to expect in the sections that follow. Electronic Industry Interdependence. This section starts by examining the relationship between the electronic systems market and the IC market, as well as how the IC market depends on the health of two smaller but important segments---the semiconductor equipment market and the semiconductor materials market. Global Economics. The world and regional GDP environments are discussed and compared to the semiconductor market environment. In addition, regional electronic systems production statistics are provided and the effects of currency exchange rates on the electronic systems and semiconductor markets are covered. Global Semiconductor Market Review and Forecast. An extensive historical review and five-year forecast through 2023 of the worldwide semiconductor market is provided. The forecasts are presented in terms of dollars, unit shipments, and average selling price, as well as by region and electronic system type. Forecast assumptions are also presented. Who and where are the world's leading suppliers of ICs? Find the answers in this section. The top 50 IC suppliers, top 50 semiconductor suppliers, and top 50 fabless IC suppliers are shown for 2017 and 2018. In addition, a significant amount of coverage is included on IC foundries and the increasingly important role they play in the IC industry. Capital spending and fab capacity levels are an important indicator of health in the semiconductor industry. As in many business situations, overspending leads to overcapacity, which leads to an imbalance in supply and demand. Therefore, it is useful to track spending (or production) and capacity trends in the industry. Worldwide Capital Spending. In addition to a review and forecast of worldwide spending, rankings of the world's biggest spenders are provided. Spending levels within each of the world's geographic regions are compared to show which areas are most aggressive in advancing production capabilities and adding capacity. Spending by IC product type is also covered. Capital Spending Cycles. 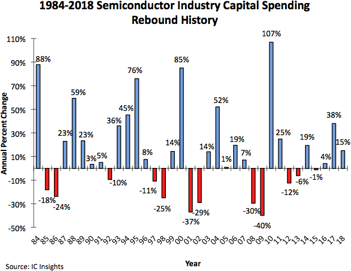 While the pronounced cycles of the semiconductor market are well documented, this section shows that capital spending trends are even more volatile. Also shown is how closely changes in capital spending and IC average selling price have tracked over the past two decades. Worldwide IC Capacity and Production. 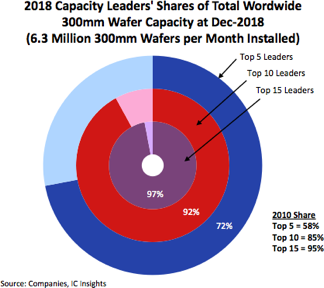 Capacity and production statistics include die-per-wafer trends, wafer start trends, capacity utilization rates, and revenue-per-wafer trends. This section includes a detailed review and forecast (2016-2023) of each IC product category (e.g., data conversion ICs, standard cell ASICs, MPUs, DRAMs, etc.). The details include dollar volumes, unit shipments, and average selling prices. In addition, the average annual growth rates for each category are listed. This section provides a brief summary of the MOS memory IC market and the various volatile and non-volatile memory products that make up the category. Trace the MOS memory market's best and worst times over the past few years and note any cyclical patterns through 2023. Non-volatile memory ICs include ROM, EPROM, EEPROM, and flash memory devices. The unifying characteristic is that they retain their stored information even after system power is removed. ROM and EPROM devices were once the backbone of the non-volatile memory market, but now take a back seat to more versatile flash memory devices. This section examines trends, reviews market, unit shipment, and average selling price data, and highlights technical advances. 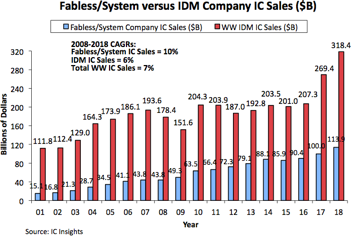 The DRAM market continues to be one of the most closely watched of all IC categories. Whether in discrete package form or embedded with other technology, these devices are a critical component in PCs and are found in a number of wireless and portable applications. This section examines the historical and forecasted markets, unit shipments, and the all-important average selling prices for both DRAM and SRAM products. 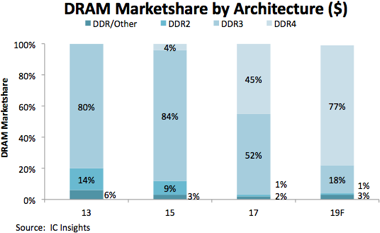 DRAM price-per-bit information and DRAM architectures are reviewed. This section features a high-level review of microprocessors, microcontrollers, and digital signal processors, all which fall under the banner of the microcomponent market. 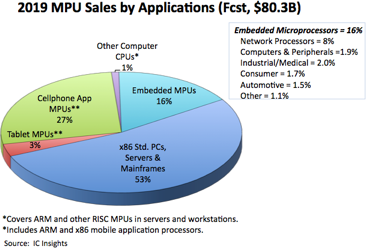 See how each of these segments contributes to the total microcomponent market. Microcontrollers are among the most ubiquitous of all integrated circuits. From 4-bit to 32-bit devices, microcontrollers are used to control and monitor both simple and extremely complex functions in the home, automobile, and office. This section reviews market, unit shipment, and pricing data and provides a review of the different segments of the MCU market. 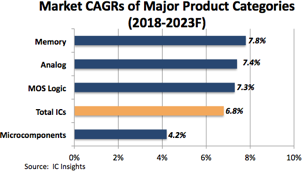 The DSP market is suffering from a loss of identity as digital signal processing functions move into application-specific standard products (ASSPs) and field-programmable gate arrays (FPGAs) fill potential DSP sockets. IC Insights reviews the market, unit shipments, and average selling price for the DSP market. From humble beginnings in 1971, microprocessors have emerged to be among the most closely followed of all IC products. 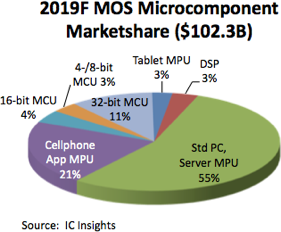 Nearly everyone recognizes Intel's dominance in the microprocessor business, but what about processors for mobile devices such as smartphones and tablet PCs? What does Intel's processor roadmap hold in store? 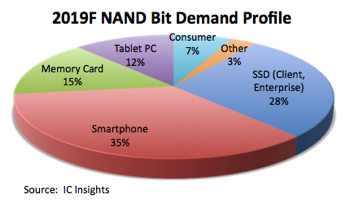 Can Intel achieve processor dominance in the market for portable handheld devices or will ARM-based processors continue to gain market momentum? 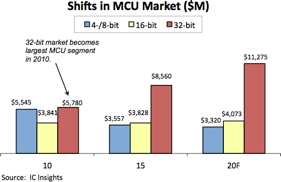 Learn IC Insights' take on the MPU market and review our forecast of market size, unit shipments, and average selling price. The application-specific IC (ASIC) and system-on-chip (SOC) market is an important segment of the IC industry. This section offers extensive coverage of ASIC/SOC market trends. 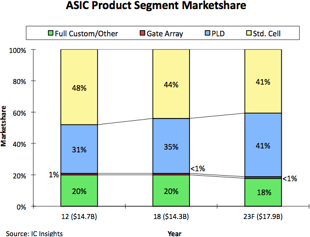 Dollar, unit shipment, and average selling price information is provided for the total ASIC market, as well as for the standard cell, gate array, and PLD sub-segments. Analog signals can be thought of as those that represent elements and conditions experienced in the "real" world. These include factors such as light, sound, temperature, and pressure. Analog signals are a continuous representation of phenomena in terms of points along a scale. 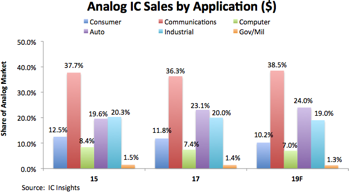 Hype and hoopla surrounding advances in the world of digital ICs often overshadows developments in the analog IC business, but as noted in this section, the analog market continues to play a steady role in the IC industry. Important market, unit shipment, and pricing data for the overall analog market and for individual segments within this market (e.g., amplifiers, interface, comparators, etc.) are provided. The success and proliferation of the integrated circuit since its discovery in the late 1950s has been due to the ability of manufacturers to continue offering more for the money. This ability to reduce the cost of ICs per performance has been driven by the continuous and rapid development of new and improved process technologies. 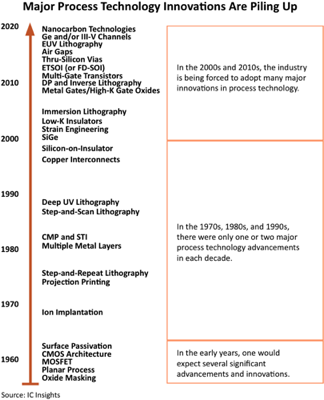 Section 14 covers a variety of process technology related trends, such as the advanced lithography methods needed to continue shrinking chip geometries, new ways to improve performance that overcome limits to scaling such as 3D integration and novel transistor structures, and the migration to larger wafers. The assembly and packaging of ICs no longer takes a back seat to front-end processing. For most new IC products, packaging is an integral part of the chip design and production process; it is no longer just a simple, final step in the chip supply chain. As a result, accelerating demand for smaller, faster, yet less expensive products is pressing the packaging industry to keep pace with advancements in IC process technology. This section provides an IC unit shipment forecast by package type (e.g., SO, FP/CC, BGA, wafer-level, bare die, etc.) and data showing how packages have evolved from simple cookie-cutter type packages to highly sophisticated and customized solutions. Details are provided on the ball-grid array, chip-scale package (CSP), bare die or direct-chip attach (DCA), wafer-level packaging, and multichip package (MCP) technologies, including stacked-chip packages. In addition to the original comprehensive study that is delivered in January, monthly updates to The McClean Report are sent March through November that review significant trends shaping the industry. An in-depth IC end-use application database is included as the June update. The July update is an extensive 200+ page Mid-Year Report that updates all of the core information found in the main report. Purchasers of The McClean Report receive these updates for no additional charge. Detailed quarterly market, unit, and pricing reviews throughout the year. On-going capital spending updates (including revisions to capital spending budgets for the world's leading IC producers). Wafer fab capacity models for tracking supply/demand conditions in the industry. 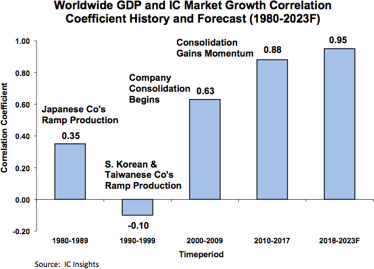 World regional economic developments that impact the IC industry. Various additional subjects related to the IC industry. Each year, IC Insights presents seminars in support of The McClean Report. Each focused and informative half-day seminar goes beyond the pages to summarize IC industry trends discussed in the report. The seminar will provide you with a better understanding of the IC industry and its future direction. Admission to the seminar is FREE with the purchase of The McClean Report. Attendees can enjoy a complimentary continental breakfast at 8:00am prior to the seminar starting at 8:30am. The seminar concludes at 12:00 pm, leaving you enough time to return to your schedule. Semiconductor units forecast to increase 7% in 2019 with IC units rising 8%, O-S-D units growing 7%. 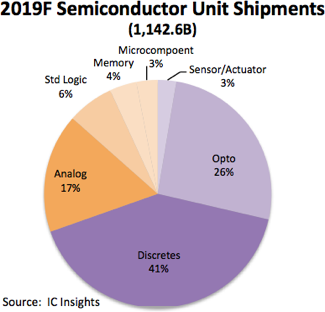 Annual semiconductor unit shipments, including integrated circuits and optoelectronics, sensors, and discrete (O-S-D) devices grew 10% in 2018 and surpassed the one trillion unit mark for the first time, based on data presented in the new, 2019 edition of IC Insights’ McClean Report—A Complete Analysis and Forecast of the Integrated Circuit Industry. As shown in Figure 1, semiconductor unit shipments climbed to 1,068.2 billion units in 2018 and are expected to climb to 1,142.6 billion in 2019, which equates to 7% growth for the year. Starting in 1978 with 32.6 billion units and going through 2019, the compound annual growth rate for semiconductor units is forecast to be 9.1%, a very impressive growth figure over 40 years, given the cyclical and often volatile nature of the semiconductor industry. Over the span of just four years (2004-2007), semiconductor shipments broke through the 400-, 500-, and 600-billion unit levels before the global financial meltdown caused a big decline in semiconductor unit shipments in 2008 and 2009. Unit growth rebounded sharply with 25% growth in 2010, which saw semiconductor shipments surpass 700 billion devices. Another strong increase in 2017 (12% growth) lifted semiconductor unit shipments beyond the 900-billion level before the one trillion mark was achieved in 2018. The largest annual increase in semiconductor unit growth during the timespan shown was 34% in 1984, and the biggest decline was 19% in 2001 following the dot-com bust. The global financial meltdown and ensuing recession caused semiconductor shipments to fall in both 2008 and 2009; the only time that the industry experienced consecutive years in which unit shipments declined. The 25% increase in 2010 was the second-highest growth rate across the time span. The percentage split of total semiconductor shipments is forecast to remain heavily weighted toward O-S-D devices in 2019 (Figure 2). O-S-D devices are forecast to account for 70% of total semiconductor units compared to 30% for ICs. This percentage split has remained fairly steady over the years. In 1980, O-S-D devices accounted for 78% of semiconductor units and ICs represented 22%. Many of the semiconductor categories forecast to have the strongest unit growth rates in 2019 are those that are essential building-blocks for smartphones, automotive electronics systems, and devices that are used in computing systems essential to artificial intelligence, “big data,” and deep learning applications.